The Power Xpert® UX is the latest offering that builds on the success and legacy of Eaton's Unitole MV switchgear. The UX is a global design that is certified to the latest IEC 62271 -100 and -200 standards. UX is a complete range up to 4000 A, 50 kA-3s short circuit withstand, and 50 kA-0.5s AFLR internal arc classification. The compact UX design is based on Eaton's leadership vacuum technology and is available in three panel widths (600, 800, 1000 mm) and 12, 17.5, and 24 kV system voltages. 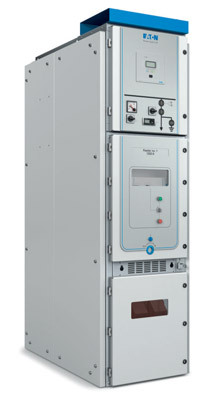 Eaton's latest vacuum circuit breaker, the W-VACi, sits at the heart of Power Xpert UX. The W-VACi, with its advanced vacuum interrupter contact designs yield longer life and are very compact. *) FC = Fan cooled.